Our Morgan gelding, Tanq, has struggled this summer with sore feet. 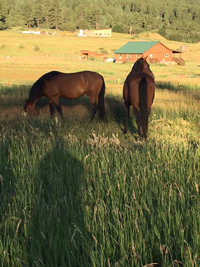 The drought in Colorado has made it hard to get hay at all, much less low sugar and balanced mineral hay. We were forced to feed more alfalfa than we would normally and Tanq put on too many extra pounds which triggered him into insulin induced laminitis. One load of grass hay I found had a super high level of iron so I had to add extra copper and zinc to my California Trace product. Another load of hay was high in simple sugars so I bought Triple Crown Timothy Balance cubes to mix with it but then the store ran out and could not get in more. Then the store ran out of regular timothy pellets. Luckily, Tanq is getting better with homeopathic remedies to help him utilize his carbohydrates and speed up his metabolism. The challenge with Insulin Resistant(IR) horses is that they love to eat but they tend toward very slow metabolism so what they eat converts to fat instead of being burned off as energy. All the extra carbohydrates consumed by IR horses that are not burned as energy or laid down as fat are consumed by sugar loving gut microbes. These sugar consuming microbes are tougher than beneficial fiber digesting bacteria so the balance is upset. A toxic gut develops when the sugar digesting microbes overgrow and produce waste products. These toxic products put extra stress on the liver and immune system. So supporting your IR horse involves a combination of feeding low calorie, low iron hay at a rate of 2% of his body weight, balancing the diet so that there are adequate amounts of copper and zinc to support carbohydrate metabolism, providing exercise to build more muscle than fat, fitting a muzzle so your horse can be out some on pasture, providing nutrients to encourage good carbohydrate metabolism such as CoQ10, wheat sprouts for antioxidants, wild mushrooms for liver support and gut detoxification, encouraging circulation with NitroPro, plus meet the individual needs of your horse. If this all sounds like a full time job, it can be. Homeopathy is a valuable tool to help the IR horse shift into a better level of health so that his entire micro biome becomes more balanced and his general vitality shifts to a better place. Homeopathy, in combination with diet and management, is needed to bring the IR horse to a place where he is able to process carbohydrates better and burn them as energy. I offer nutritional and homeopathic consults to help you find the best program for your IR horse. One on one mentoring is an option for those who want to learn, in depth, how to support horses with nutrition or homeopathy. The goal for supporting the Insulin Resistant horse is to bring him to the highest level of health possible so you and he can both have a good life.